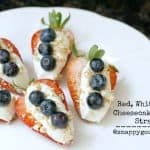 Red, White, & Blue Cheesecake Stuffed Strawberries, an easy recipe for Fourth of July or summer with strawberries, blueberries, and cream cheese. Ready for some quick and easy STUFFED STRAWBERRIES this summer?? 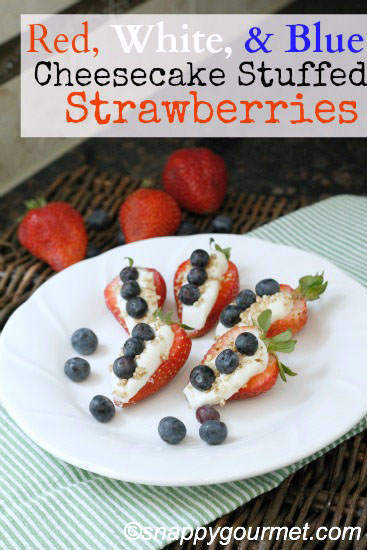 This gluten-free recipe for strawberries stuffed with cheesecake is ready in no time! 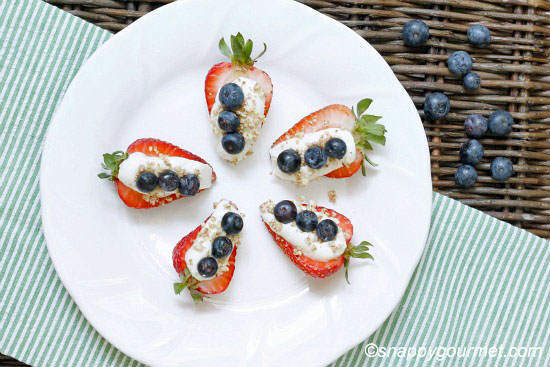 And they’re red, white, and blue making these stuffed strawberries a perfect Fourth of July recipe!! Add a little amaretto or almond extract to the filling and you have a fun treat great for summer parties! 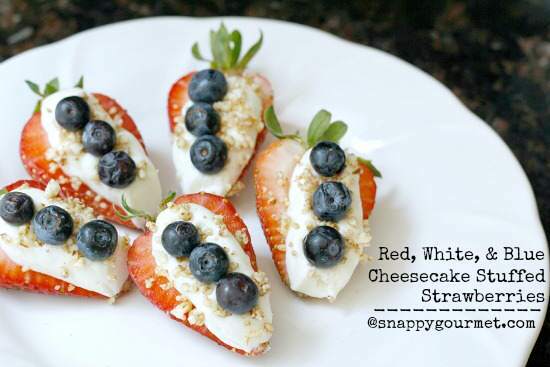 Want more red, white, and blue recipe ideas? Check out my Summer Berry Vodka Granita and Red, White, & Blue Velvet Ice Cream Sandwiches. Most recipes for stuffed strawberries have you scoop out the inside of the strawberries which can be time-consuming and a lot of work! Instead, I just cut the strawberries in half and “pipe” the filling right on top of each half. The filling for these stuffed strawberries is easy to make with not many ingredients. Mix together softened cream cheese (I used Philadelphia regular cream cheese, but you could also use the low fat), sugar, and your choice of vanilla, almond extract, or Amaretto. Spoon the filling mixture into a small ziploc bag, cut off a corner, then “pipe” the filling onto the strawberry halves. 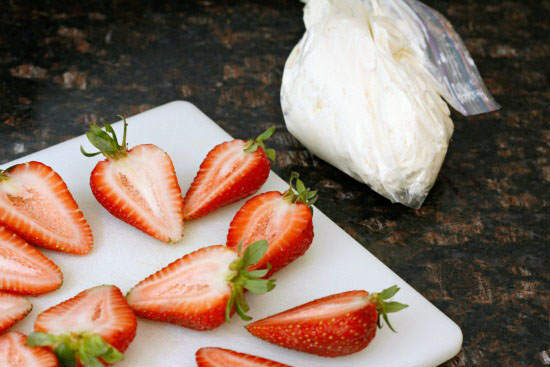 You could also use a pastry bag or just spoon the filling on top of the strawberries. Sprinkle some chopped nuts (I used chopped almonds which is also a great gluten-free option), crushed graham cracker crumbs, or crushed cookies on top along with a few blueberries. That’s it! Be sure to store these stuffed strawberries in your refrigerator until you’re ready to serve. Just a quick note…these stuffed strawberries are great to make ahead of time BUT the nuts, graham cracker, or cookie crumbs will get soft and soggy the longer you leave the strawberries in the fridge. So don’t leave the strawberries in the fridge too long or sprinkle the crumbs on top before serving if you don’t want the crumbs soggy. Enjoy! 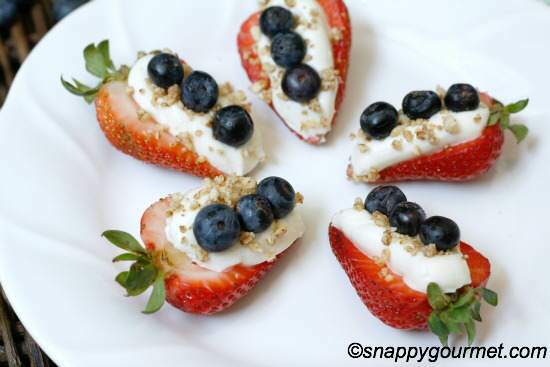 Cheesecake stuffed strawberries perfect for summer and Fourth of July! In a small bowl, mix together softened cream cheese, sugar, and Amaretto (or vanilla or almond extract) until well combined. Spoon filling into a small ziploc bag, seal bag, and cut off one corner of bag. Pipe filling on top of each strawberry half. Sprinkle almonds (or graham cracker/cookie crumbs) on top of filling. Top each strawberry half with 3 small blueberries. Store in refrigerator. SNAPPY TIPS: Instead of a small ziploc bag, you can use a pastry bag with desired tip or use a spoon to top strawberries with filling. If making gluten-free be sure to check all product ingredients. SNAPPY SUBSTITUTIONS: Instead of Amaretto, vanilla or almond extract can be substituted. Instead of chopped nuts, you can use graham cracker or cookie crumbs. Oreo crumbs would be great! These are too cute! They’d be perfect at a summer BBQ party! What a fun idea! I bet these are good! Love it! I added you to my RW&B recipe round up, with a link back to your site for the recipe, of course. If that’s not OK, please let me know! Thanks! !